December 2, 2014 - Long before southern Arizona was part of the United States and long before it was part of Mexico, back when it was part of the territory of New Spain, the town of Tucson was born. Its name is a Spanish adaptation of "S-cuk Son," which is what Tohono O'odham Native Americans called their village. 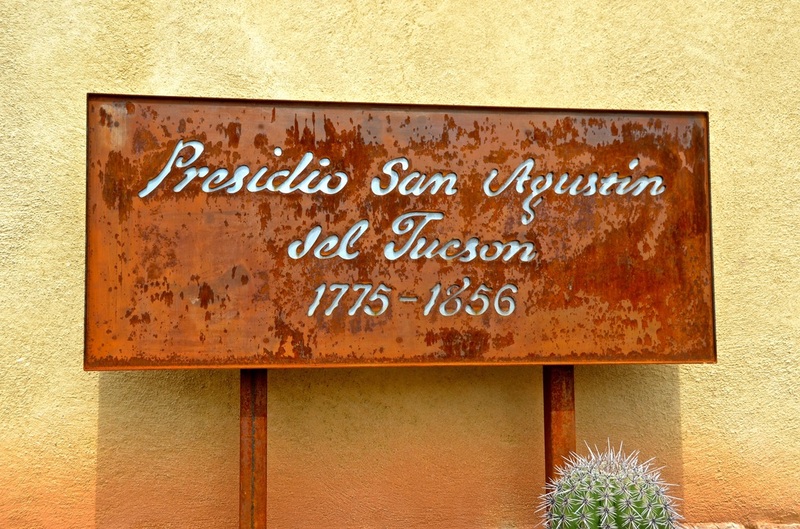 But the name Tucson is what stuck, especially after 1775, when the Spanish decided to build a fort to protect the village and called it Presidio de San Agustin del Tucson. 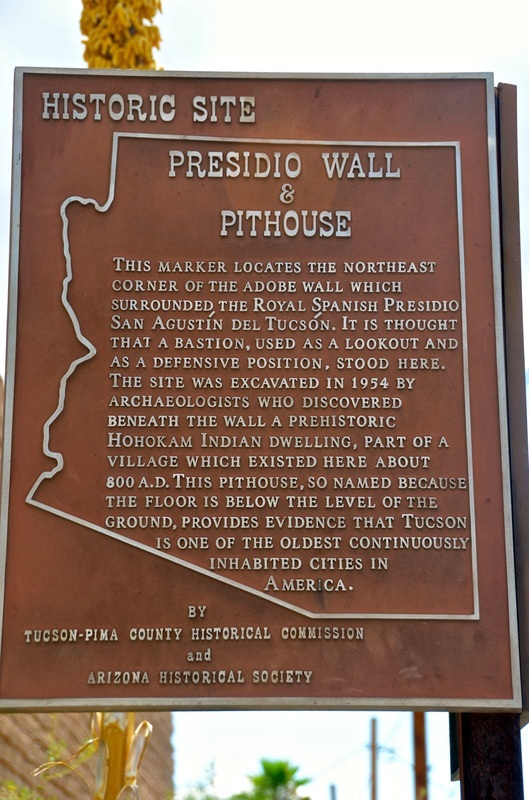 "For about 80 years, the adobe walls of the Tucson Presidio protected the residents of the area from attacks by Apache groups, who opposed Spanish and Mexican peoples and their native allies beginning in the 1600s," according to a historical marker outside today's presidio, which is a re-creation of a small portion of the original fort. 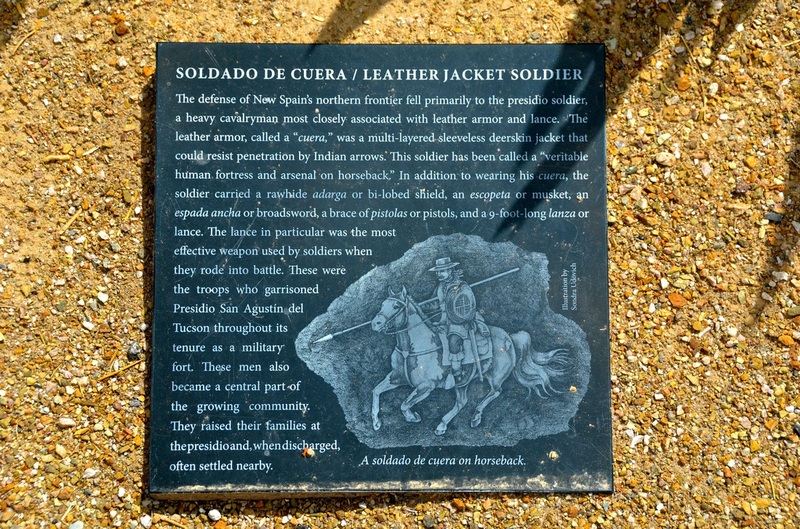 "The Spanish military designated the site in 1775 on the location of a prehistoric native village site," the marker explains. 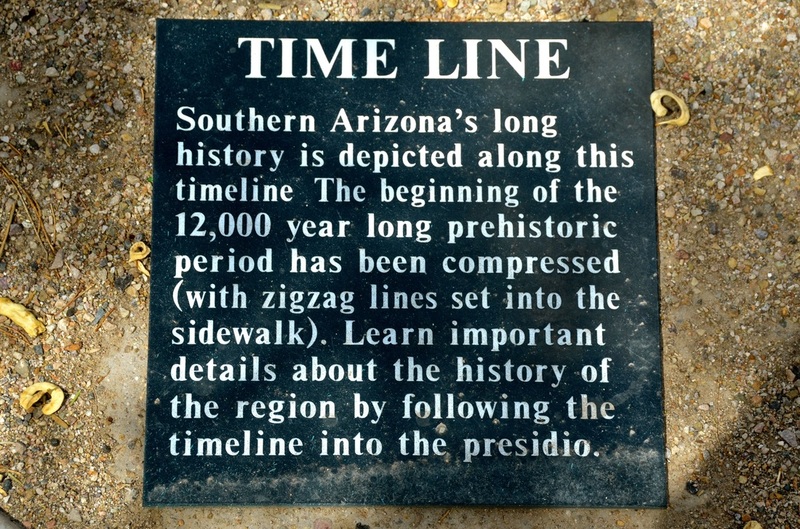 And that's why Tucson is considered one of the oldest continuously inhabited cities in the United States — because it goes back to about A.D. 800. 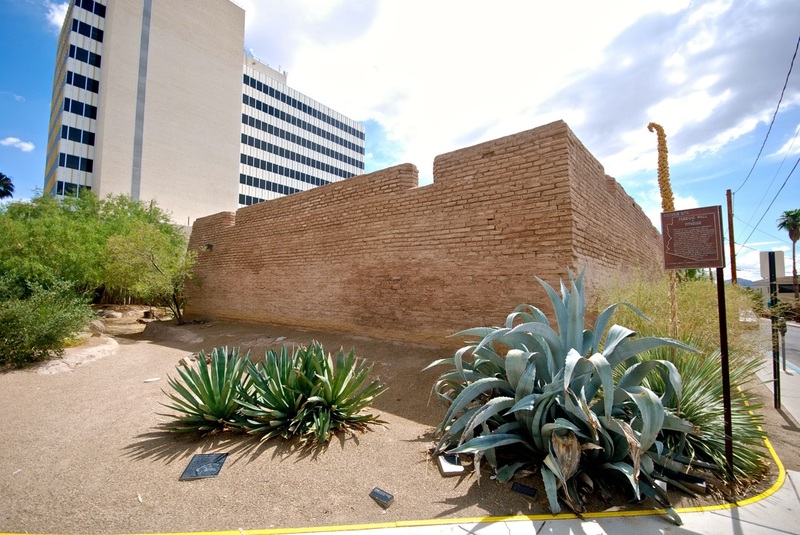 The new fort was built in 2007 in the area where an archaeological excavation had located the presidio's northeast tower, at the corner of Washington Street and Church Avenue in downtown Tucson. It features a self-guided tour of the living quarters for soldiers and their families, a munitions room, a commissary and an impressive plaza mural depicting 18th-century life at the fort. The presidio also hosts living history events and re-enactments with costumed volunteers, who weave, carve wood, make leather goods, bake and cook in an outdoor adobe oven and practice military drills as 18th-century Spanish soldiers. "The fort housed 100 soldiers at its height, and 300 civilians lived in the area, with several hundred O'odham and Aravaipa Apache allies in the vicinity," the marker explains. "The interior walls were lined with residents, stables, a blacksmith shop, and warehouses." Although the site of the fort was selected in 1775 — by Capt. Hugh O'Conor, an Irish mercenary working for Spain — its construction didn't begin until the following year. That's when a squadron of Spanish soldiers was sent north from the Tubac Presidio, established three years earlier, and began construction of the founding structure of what became the city of Tucson. 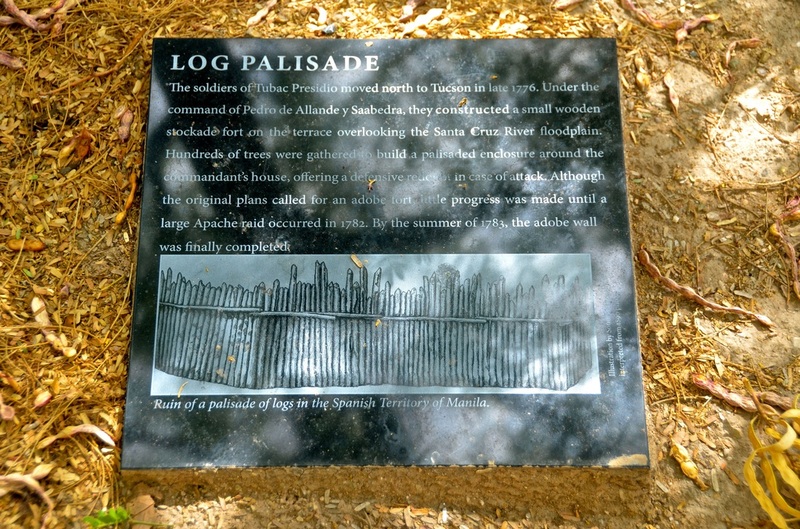 "Under the command of Pedro de Allande y Saabedra, they constructed a small wooden stockade fort on the terrace overlooking the Santa Cruz River floodplain," another historical marker explains. "Hundreds of trees were gathered to build a palisaded enclosure around the commandant's house, offering a defensive redoubt in case of attack." But it was only a few buildings surrounded by a fence of wooden stakes, and it proved to be highly vulnerable to attacks by Apache raiders. Two other nearby Spanish presidios, Santa Cruz de Terrenate and San Bernardino, already had been abandoned in 1780 because of these raids, and in 1782, Spanish authorities were convinced that a stronger fence was necessary to save Presidio San Agustin del Tucson. "Although the original plans called for an adobe fort, little progress was made until a large Apache raid occurred in 1782," the marker adds. "By the summer of 1783, the adobe wall was finally completed." 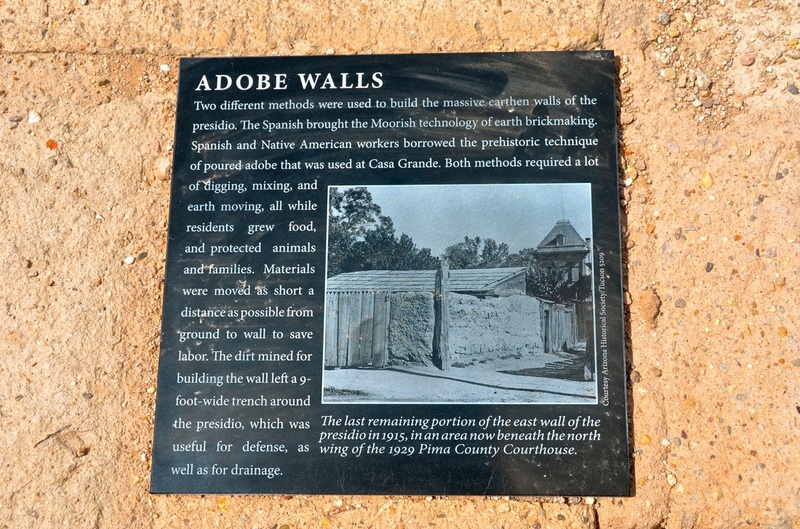 And when they mined the earth to make adobe bricks, the Spanish and their Native American allies created a ditch — 9 feet wide and 2 feet deep — around the outside of the presidio wall, making it seem higher to those on the outside. 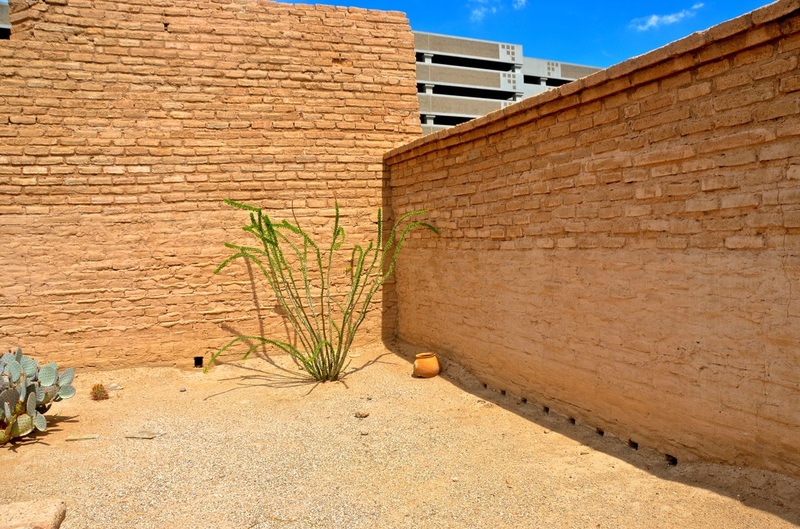 The adobe walls saved the fort that was the foundation for today's Tucson. 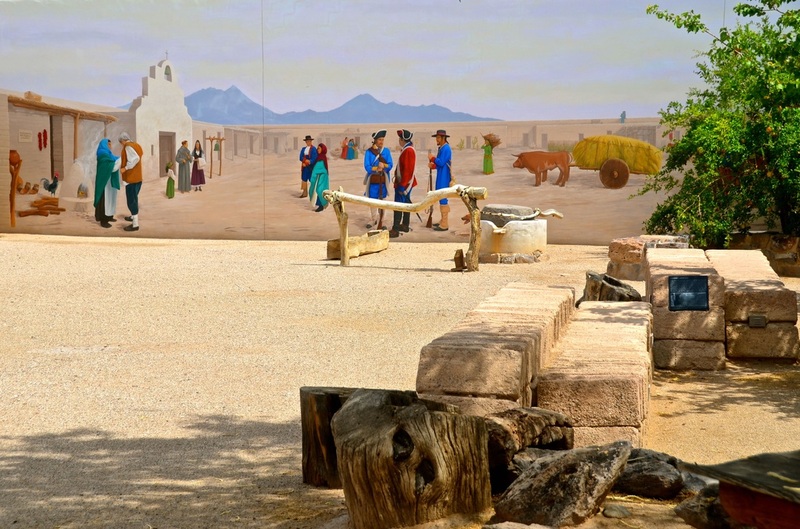 Many of the first settlers of Tucson were former Spanish soldiers who "raised their families at the presidio and, when discharged, often settled nearby" and "became a central part of the growing community," another marker explains. But how did Tucson get from an 18th-century colonial walled compound to the thriving metropolis it is today? 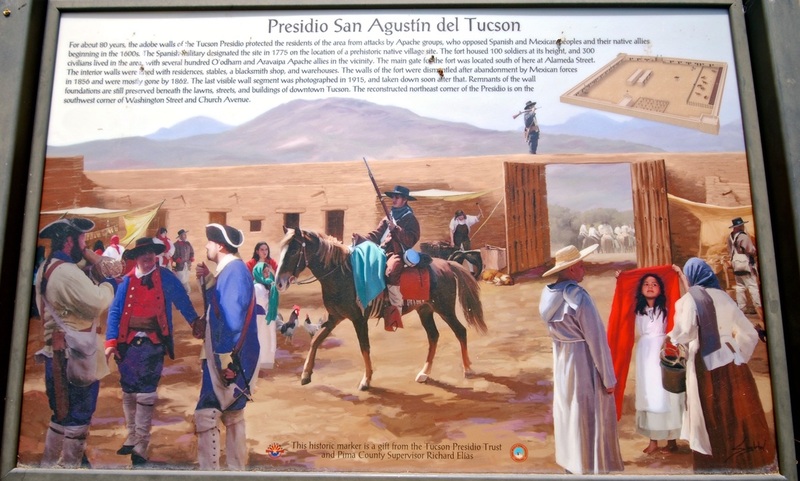 When you visit Presidio San Agustin del Tucson, even before you enter you get a great lesson on the history of southern Arizona. In capsulized messages carved on marble stones on the grounds around the outside of the presidio, you follow a history timeline that makes you appreciate the place where you are standing. —Some 4,100 years ago, "maize (corn) arrived from Mexico and farmers settled in pithouse villages along the Santa Cruz River. By 3,200 years ago, Tucson farmers built and grew maize, squash, beans, cotton, and tobacco." 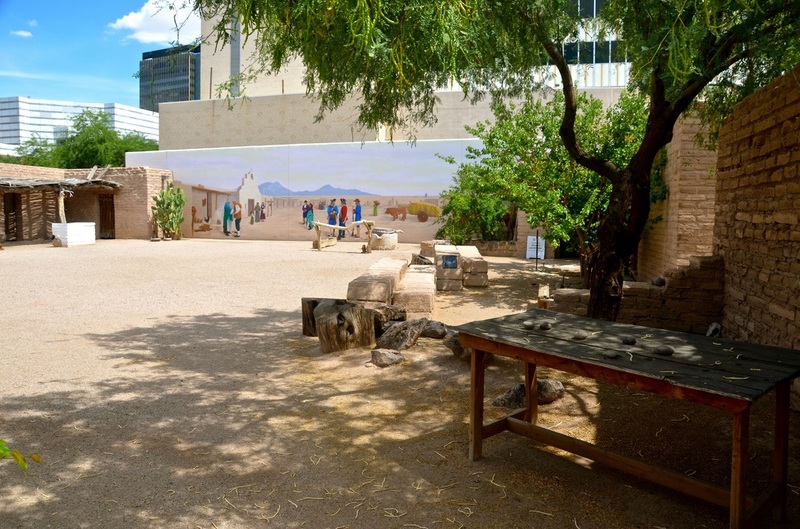 —From A.D. 500 to 1450, the Hohokam natives built "ball-courts and platform mounds, and made painted pottery and carved shell jewelry" in the Tucson area. —In 1492, as Christopher Columbus was discovering the New World, "O'odham villagers were using irrigation canals to farm on the marshy Santa Cruz River floodplain." 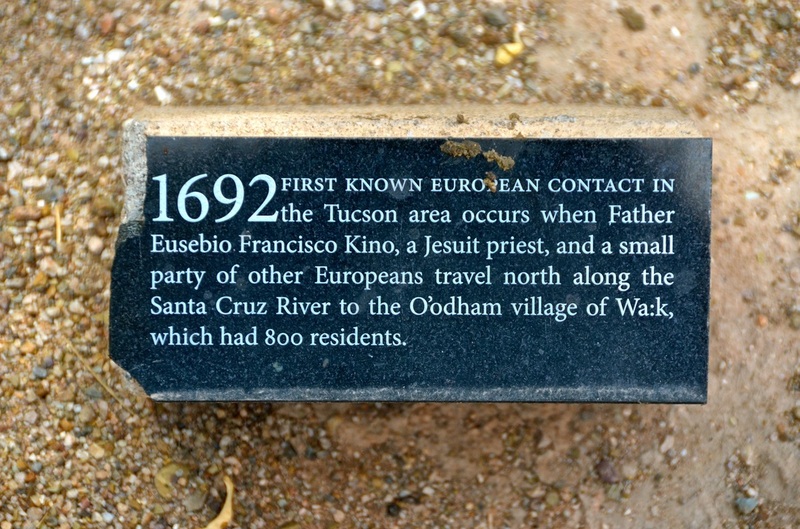 —In 1692, the "first known European contact in the Tucson area (occurred) when Father Eusebio Francisco Kino, a Jesuit priest, and a small party of other Europeans (traveled) north along the Santa Cruz River to the O'odham village of Wa:k, which had 800 residents." —In 1751, "during the Pima (Native American) revolt, a faction within the O'odham, led by Luis Oacpicagigua, (rebelled) against Spanish control and (killed) more than 100 Spanish settlers. In response, the Presidio San Ignacio de Tubac, a Spanish fort, (was) established in 1752." —In 1775, "Captain Juan Bautista de Anza and his soldiers (passed) through Tucson with 198 people from Mexico. Anza (was) leading the settlers to California to establish the presidio (and the foundation for another city) in San Francisco." 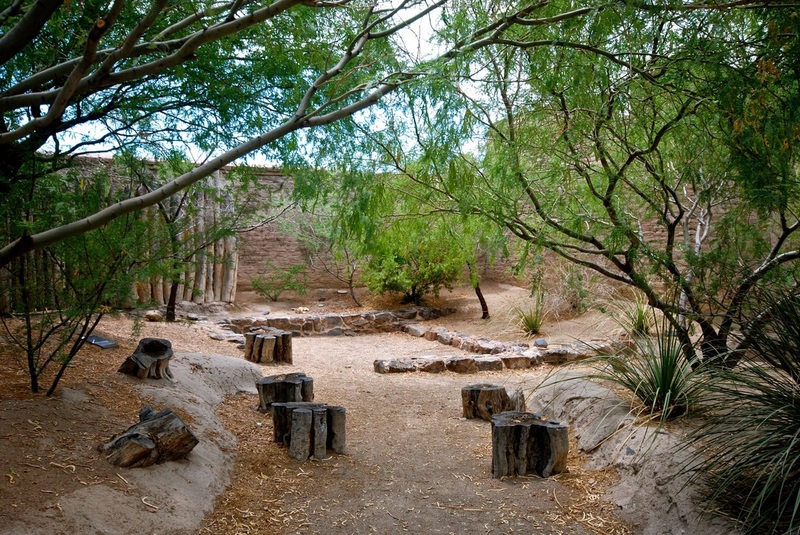 —In 1793, "several hundred Aravaipa Apache, led by Nuatil Nilche, (agreed) to settle next to the presidio. They (gave) up raiding and, in exchange, (were) supplied with food, clothing, and tools and (became) known as the Apache Manso." —In 1797, "the census of Tucson (listed) 395 soldiers and civilians living inside the presidio." —In 1815, "Spanish soldiers from Tucson (were) sent to Mexico to fight revolutionaries" who were battling for independence from Spain. And in 1821, "Mexico (achieved) independence from Spain. Mexico (ended) the system of providing the Apaches with supplies. Soon, Apache raids (were) renewed, disrupting the lives of residents of Arizona and Sonora, who (lived) at ranches, mines, missions, and presidios." —In 1849, "during the California gold rush, hundreds of people (used) Tucson (then part of Mexico) as a stopover on the way west." —In 1854, "the Gadsden Treaty (made) Tucson part of the United States instead of Mexico. In 1856, Mexican soldiers (withdrew) from Tucson, and Americans (raised) their flag. The walls of the adobe presidio (were) torn down over the next decades, with some of the adobe bricks reused in new structures." Other markers at the presidio explain that "the walls of the fort were dismantled after abandonment by Mexican forces in 1856 and were mostly gone by 1862. The last visible wall segment was photographed in 1915, and taken down after that. 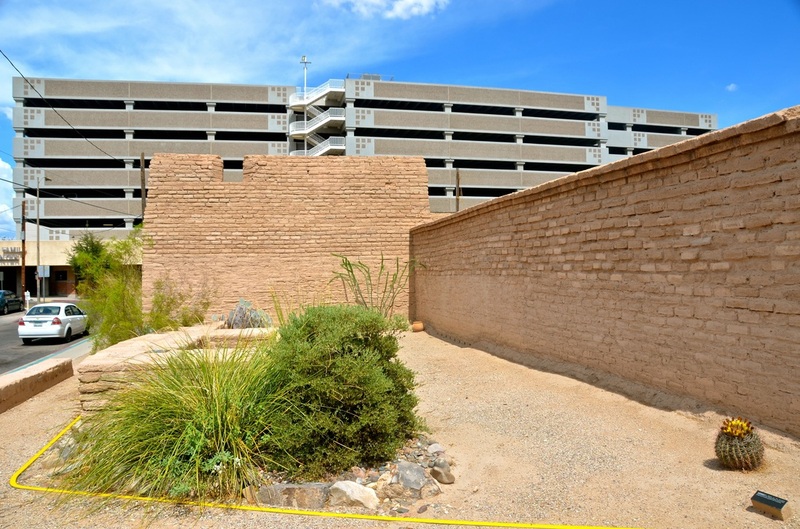 Remnants of the wall foundations are still preserved beneath the lawns, streets, and buildings of downtown Tucson." 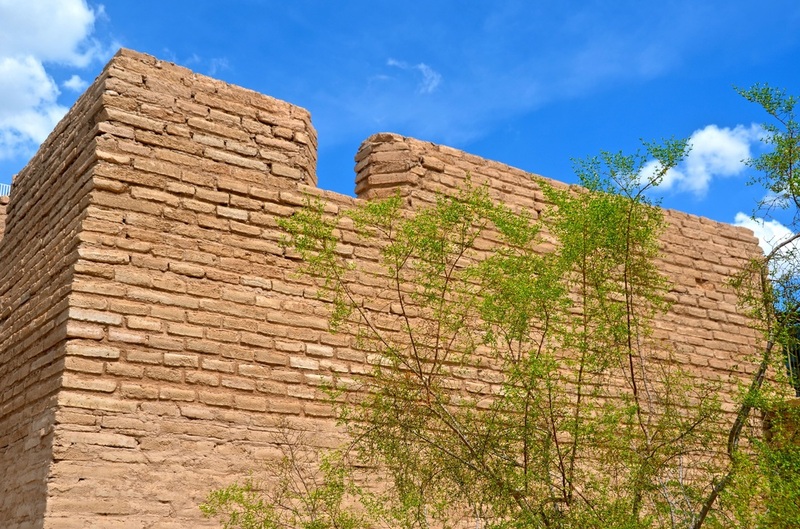 Even after the fort was no longer functioning, in the second half of the 19th century, Tucson became a major headquarters for U.S. Army campaigns against the Apaches, and remnants of that wall served as refuge for settlers, until Geronimo's surrender in 1886. 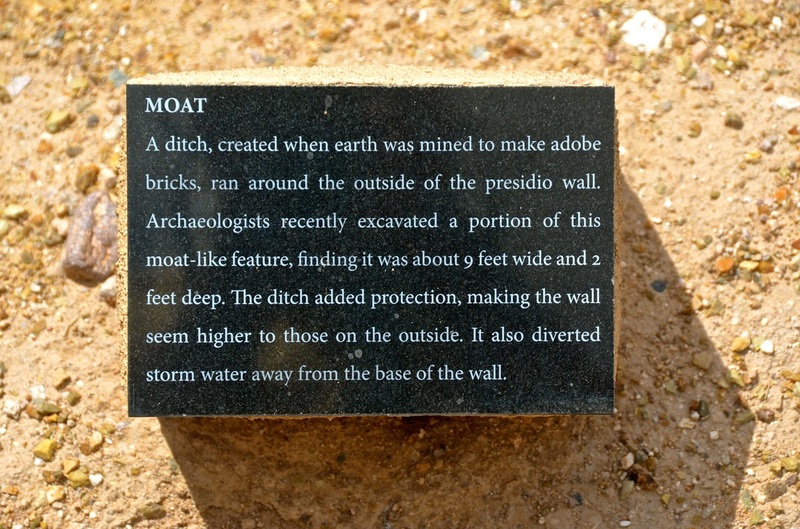 Yet another marker explains that "the site was excavated in 1954 by archaeologists who discovered beneath the wall a prehistoric Hohokam Indian dwelling, part of a village which existed here" circa A.D. 800. 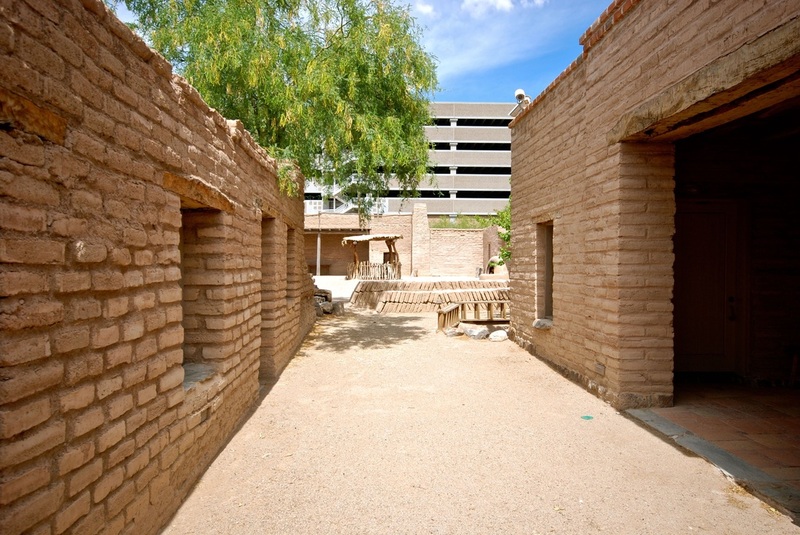 "This pithouse, so named because the floor is below the level of the ground, provides evidence that Tucson is one of the oldest continuously inhabited cities in America." It's also a city with lots of hidden Hispanic heritage — including its Spanish-adapted name! Next week, the Great Hispanic American History Tour heads north to the Arizona-Utah border — in search of Hispanic heritage now hidden under a lake.